This photograph of a wolflike animal purportedly was taken in the Gorham area in October. However, a state wildlife biologist, while agreeing the animal resembles a wolf, is "very skeptical" the scene was photographed in that part of Maine during the fall, suggesting - because of the vegetation and plant matter - that the locale looks more like Oregon. 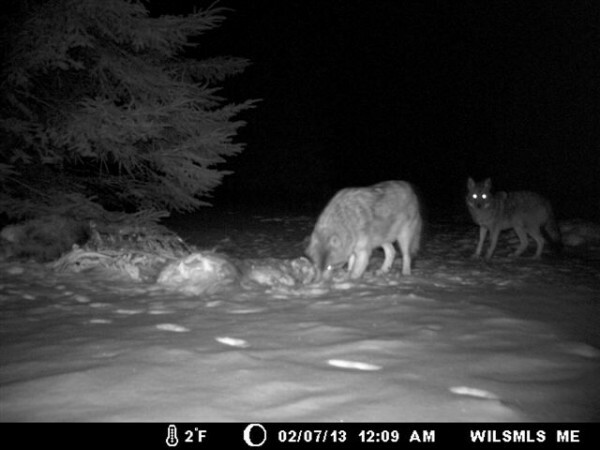 These canids were photographed with a trail camera in the vicinity of Wilsons Mills in February 2013. A state wildlife biologist says the animal on the right is a coyote while the larger animal on the left showed "some wolf characteristics." 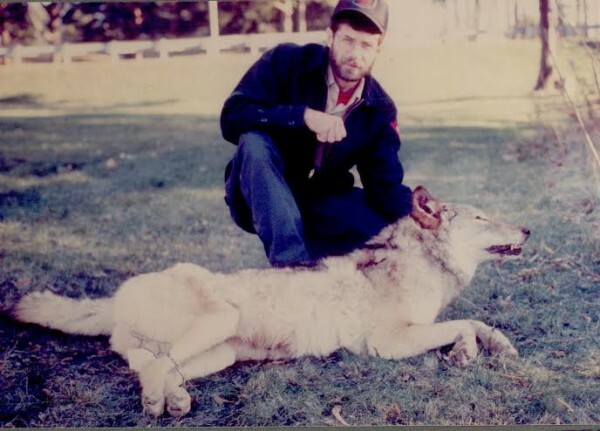 Genetic tests on an animal killed in 1996 near Aurora, about 35 miles east of Bangor, initially indicated it was a wolf, but later tests with improved techniques revealed it had been eating a diet of corn or animals that fed on corn. A state wildlife biologist says the animal "most likely" was a wolf hybrid. An animal taken near Aurora in 1996 (top) exhibits "some wolf characteristics," a state wildlife biologist says. The other animal (bottom) is a coyote. Are there wolves in Maine? While most wildlife experts agree that Maine would be a great place for wolves because it has abundant habitat to support them, they say there is no resident population of breeding wolves here. But a group that advocates for the natural recovery of wolves in Maine sees things differently, and occasionally it comes across some intriguing photographs to back up its claim. “We believe very strongly wolves are here,” said John Glowa, founder and leader of the Maine Wolf Coalition. The animals have been documented in Massachusetts and New York, he noted, as well as Quebec and New Brunswick. Maine contains “tens of thousands of square miles, much of it suitable for wolf habitat,” he noted. “Science tells us wolves are here,” concluded Glowa, who lives in South China. Glowa’s view puts him at odds with a pending proposal by the U.S. Fish and Wildlife Service to remove the gray wolf from the protection of the Endangered Species Act in the lower 48 states. The agency contends gray wolves never lived in the eastern third of the country and should not have been put under federal protection in 1978. The proposal also is based on the successful recovery of the gray wolf in the Western Great Lakes and Northern Rockies regions. Opponents of the delisting, including the National Wildlife Federation, argue that the U.S. Fish and Wildlife Service has not shown that gray wolf populations in the Northern Rockies and Western Great Lakes have recovered sufficiently to have federal protections removed. In Maine, it is the the eastern Canadian wolf, Canis lycaon, that existed historically. It is considered a separate species from the gray wolf by federal wildlife officials. However, the U.S. Fish and Wildlife Service is deferring a decision about possibly listing the eastern Canadian wolf as endangered in the Northeast until Canadian officials complete a status review of that species. It is unclear when that review might be completed. Regardless, Glowa is fearful that any wolf population in Maine — whether gray or eastern Canadian wolf — would be doomed if the gray is taken off the endangered species list now. “Once the gray wolf is delisted here, wolves in Maine will have no federal protection whatsoever,” he said. There has been no documentation of a breeding wolf population in Maine, noted Mark McCollough, senior endangered species biologist for the U.S. Fish and Wildlife Service in Orono. If a breeding population of wolves established itself, “There would be plenty of evidence,” he said. Walter Jakubas, mammal group leader for the Maine Department of Inland Fisheries and Wildlife, who works in the agency’s Bangor office, agreed. “As far as I know, we do not have a wolf population in Maine,” said Jakubas. He said the department supported the delisting when it first was proposed two years ago. McCollough said a federal decision on the delisting proposal may be made in about six months, although it may take longer. There are two reasons wolves should be allowed to recover here, said Glowa: ecology and economy. “Wolves are an important part of the ecosystem” and would help control the moose and beaver populations, he said. A recovered wolf population in Maine would attract visitors who want to try to see and hear them, said Glowa. That kind of wildlife tourism would “certainly help to boost Maine’s rural economy,” he said. “Wolves are big business — live wolves,” said Glowa. 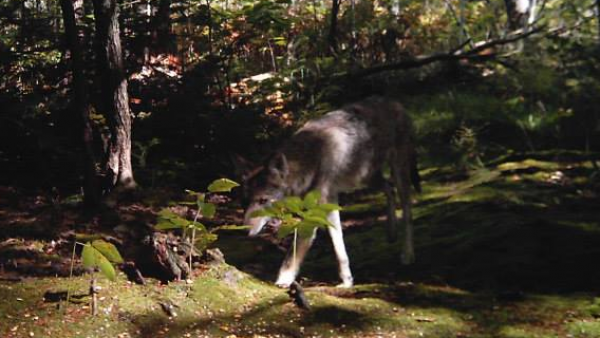 Glowa provided photographs of wolflike animals recorded by trail cameras in Maine in 2013. One photo, taken in February in Wilsons Mills in western Maine near the New Hampshire border, depicts two animals together at night. The other photograph, of a single animal, was taken in southern Maine in mid-October. The larger animal in the photograph is “definitely not an Eastern coyote,” said McCollough, although the smaller animal appears to be a coyote. The evidence examined by a state wildlife biologist who visited the site was inconclusive, according to Jakubas. “I would never say it was a wolf. It had some wolf characteristics,” Jakubas said. Even Glowa agrees there is “really no way of telling” if the large animal is a wolf. However, the photograph taken in mid-October, purportedly taken in Gorham, “looks very, very much like a wolf,” said Glowa. The animal has the appearance of an Eastern wolf because of its long legs and snout, he observed. Jakubas said the animal resembled a wolf but he was skeptical of the image; the plant matter and vegetation are more indicative of Oregon, he said, not southern Maine. Greg Douglass says he recorded the image with a trail camera behind his Gorham home. A status assessment of the eastern Canadian wolf performed for the U.S. Fish and Wildlife Service by a pair of Wisconsin wolf experts cited studies indicating that “Maine has large areas of suitable wolf habitat and could support a fairly large wolf population.” The 2011 assessment found no evidence that wolves were successfully dispersing into Maine, although the authors recognized “some potential” for doing so. For Glowa, the main issue is that wolves were here before and deserve to be here again. The gray wolf once inhabited North America except for parts of California and the Atlantic coastal plain south of Virginia. But it was hunted and eradicated from 95 percent of its historic range in the lower 48 states — small populations persisted in parts of Minnesota and Michigan — and was eliminated from Maine by the 1890s. “There are all kinds of impacts that would occur if wolves were allowed to return … changes for the better,” he said.